Squash’ed » Give it the boot? So, 4 weeks to the day (almost the hour!) since ATR. Largely due to the inspiration I’ve found on here I’m walking around in the boot without using crutches. Not easy to walk well or quickly, no pain and mentally it feels like a step in the right direction. Monday took out the first wedge in the boot (although I was told to leave all five in for 2 weeks). Thanks largely to doug53’s story I can’t help thinking my body is much more capable than people would lead you to believe. To the point yesterday where I went to two shoes and hobbled around the house. Again no pain, no problems and it felt great. However, one of the battles is persuading everyone else this is a good thing to be doing. I get a lot of opinions from family and friends asking “should you be doing that?”, quickly followed up with advice like “you don’t want to risk re-rupture, that would be a disaster!”. Tomorrow I’m going to visit a Chiropractor/Physio really to see if I can get some solid advice on what I *really* can be doing rather than the standard of line that you can’t do anything. My official PT appointment isn’t for another 3 weeks and post-op follow-up from the boot another 2 weeks after that. Does walking without crutches mean I can move my status to FWB? I know this isn’t a race and you can’t rush these things but a huge part of me thinks (and feels) things can and should be moving much faster than the medical profession would have you believe. Also achieved another milestone today by taking a stand-up shower! Been away from the site for obvious reasons, but appreciate you checking in. So 15 months on where am I? For now I have decided not to contemplate another op, I have no real reason to do this in that I can do pretty much everything I could before, I’m in no pain and the thought of that recovery period over again fills me with dread. I can feel my right leg is “different” from the left, but I don’t walk with a profound limp. So I have zero motivation to contemplate a re-repair. I didn’t ski in February, but that was largely due to other reasons. I can swim and I’ve been running with no adverse side effects. I know I don’t have the running pace that I previously had, but I’m not training for the Olympics! I guess I’m about 1 minute per mile slower than I was before the rupture. I haven’t ventured back onto the Squash court and suspect that would “better” expose the inherent weakness of the repair in terms of my ability to push off from that leg. I have, however, signed up for a sprint triathlon (400m swim, 20K bike and 5K run) in June and have no qualms about doing this. I think of you now and then, and I hope things have worked out well for you, however you decided to handle it. I hope you’re doing okay, and enjoying the summer some. I can’t say I blame you if you’re too frustrated for words. I guess we’ll never know for certain if it was the surgery itself or something after. I just hope things can get better without another surgery, but if surgery is what it takes, then that’s what it takes. Another thought on things that might encourage “spontaneous” tendon shortening, besides some sort of splint to limit dorsiflexion and a nighttime plantarflexion device, is, maybe, using wedges under the heel. I have no idea if any of that would actually help, but it seems plausible and seems unlikely to hurt anything. Thanks for the detailed comments. Exactly the questions I’m contemplating at the moment. Had MRI on Friday, results in the next week or so. If I’m not going to do any further damage then any 2nd op will be postponed for so some (possibly considerable!) time, so I guess I’ll be a good test case to see how much strength I can actually get back during this period. Until I get the results of the MRI though can’t make much progress on the options. I’m pretty resigned to needing further surgery at some point. Going back over the last 10 weeks (and as peterh pointed out), I was already able to dorsiflex past 90 degrees when I first went to see the physio and I was only just out of cast and into boot (with wedges!) at that point, which points to potentially a “long” initial repair. I’ll certainly keep the blog updated with results and decisions. peterh: Be careful with those tight hammies. That equals low back problems. I am on a really aggressive hamstring stretching protocol right now. It is actually helping my low back. jgsquash: I hope it isn’t so. It can be really frustrating going back in but if that does happen, you will be thankful one day. I am at that “one day” and I am really thankful I had it dealt with. I had to have both of mine lengthened . (Believe it or not the length of the Achilles is a huge problem the other way as well too.) Lot’s of luck wished to you. I’m sorry to hear the news. I am very curious to follow your progress and the MRI results. Reading through your blog, it seems more likely to me that the tendon was repaired long in the first place since you only starting going and doing more activity after the physio realized you had gotten to “neutral and beyond” so early. Also, you seem to have had a different type of surgery as to most. The MRI will hopefully let us know for sure. I also question whether the “too long” condition is permanent. The tendon will never get shorter, but won’t the muscles shorten over time if they are not stretched? I don’t know about you guys, but my hamstrings for example get shorter every year that I don’t do regular stretching. I can’t touch my toes anymore, and used to be able to. Hey Doug, thanks as always for the thoughtful and insightful reply. Let me start by saying that whilst I had read your experiences with interest, whatever path my recovery took was my decision and my decision alone so there’s no finger pointing or blame here. Also remember that I was acting on my own feelings (and I really am no doctor) and advise I had got independently so there is absolutely no reason for you to be sorry. To your points. Your brake cable analogy is the right one and basically I think sums up the problem which is with the tendon too long I can’t contract it enough. So I actually have the opposite of what I need, i.e. I can’t plantarf lex my bad foot as far as the good one. If I dorsiflex the foot then I can bring the bad foot further towards me than the other one. I’m lead to believe that surgery is the only way out to basically repair the tendon and shorten it. We could leave it, but like the brake cable no amount of the fine tuning adjustment is going to compensate for the cable being too long and the brakes will never work properly. Bugger, indeed, but I’m still wondering exactly what is wrong, what is meant by “too much dorsiflexion.” Does that mean that, if you sit down, put your two heels on the ground, side by side, and pull up your toes, your repaired foot comes up more that your other foot? More importantly, does that mean that you can’t plantar flex your repaired foot as far as your other foot? The latter problem strikes me as the crux of the issue, as greater dorsiflexion range of motion, in and of itself, isn’t a problem, unless perhaps you go that far a lot and it bothers other structures, like perhaps your peroneal tendons, if they don’t want to stretch that far. hI, thats a really heart renching story, but your message is clear. Take care and I hope your decision is a sucessfull one and that you make your skiing trip. Thanks for confirming my progress to FWB. I can definately stand on the bad leg alone. Hope your appointment with the specialist goes well tomorrow. I did the Thompson test on myself. I’m at 6 weeks. The injured foot moves about 1/2 the amount of the good foot. I think this may be mostly because the muscle is smaller giving less effect when squeezed (think about the extreme if your muscle was thin like a string - it wouldn’t shorten much when squeezed). thanks for all the comments, a quick update. 3. The spot of pain is still there but appears to be easing. Actually the pain is more acute when I roll the foot inwards (is that the opposite of eversion?). I think the theory about the peroneal tendons is a good one. I have managed to get an appointment privately with the consultant that operated on me for tomorrow so I’ll discuss all three points with him and report back. Yeah, I wasn’t very clear there, was I? I was thinking the whole leg pointing up, so gravity would tend to pull the foot into dorsiflexion and stretch the tendon slightly. As far as the tendon being too long, I guess one way to test that would be have both legs pointing up, flex both calves, and see if the injured foot points upward as much as the other one does. If it can’t, and the tendon doesn’t feel as tight as it should while doing that, maybe it really is too long. I’m a cyclist, so I’m thinking a long tendon would be akin to a stretched brake or derailleur cable that needs tightening up. (Maybe our tendons should have one of those barrel adjusters put in during surgery?) If the peroneal tendons are the source of your pain, everting the foot should hurt. Thanks for the comments guys. Quick response as I’m about to go out. Doug I think you could be right, the pain is on the outside of the ankle and the peroneal tendons could be the cause. When you say shin pointing straight up do you mean shin facing the ceiling? or the whole leg pointing up in the air so the shin is actually facing behind you as you are lying down. I’ll re-try the test a little later. Part of me thinks I’m ok but part of me thinks something isn’t quite right. If I’m not mistaken, the Tompson test should be done while lying down prone, not kneeling on a chair. The difference is that your knee is straight; the gastrocnemius muscle (the outermost calf muscle) is pulled tighter since its attached to your femur. With your knee bent, only the underlying soleus can really get short enough to pull on your heel, but it is difficult to squeeze the soleus as it is underneath the gastrocnemius. Anyways, I hope there’s no real problem, as a too-long achilles is bad and you will have difficulty getting full strength from it. I know my surgeon was worried about this and told be not to put any significant load on it for the first 6 weeks. Regarding the Thompson test, try doing it again while lying on your back and your leg up in the air, so that your shin is pointing straight up. Then pull your toes toward your knee, then relax, then squeeze the calf. The squeeze is more likely to work if you start from a slightly dorsiflexed (but relaxed) position like that. If I’m reading your picture correctly, the pain is off to the side of the Achilles a little bit. The peroneal tendons go through that area, and may be the source of the pain. Perhaps the peroneal tendons got caught in some scar tissue? Maybe you could test this by using your own leg muscles to twist that foot so the ball of the foot goes down, and the little toe comes up (eversion). Thanks all. I can’t work out whether I’m worrying unduely and am being impatient or if there’s really something not quite right. Just rang the private secretary to get in (privately) and see the consultant who operated on me (under the NHS) would take until July! Seeing the NHS physio next week to might pursue NHS referral from her back to the consultant which might be quicker! MRI might be an option but I’d have to have that recommended by a consultant for it to be covered. jg, I would get it checked out asap, doesn’t sound right to me. NHS failed me miserably so I had to go private. Get a second opinion, if for no other reason than you are troubled by this problem. Too many doubts in your mind at the moment and they need to be cleared. Maybe there is some mild infection there that needs to be treated. I went Private fortunately I was covered by PPP, saw Dr. Dalal in Manchester, a good man. 1. Mr. James Calder (Consultant at Hampshire Foot & Ankle Centre - I think he also operates (privately) at the Cromwell Hospital in London. 2. Mr. Mark Davies (Consultant at London Foot and Ankle Centre - he operates at the following hospitals in London - St. John and St. Elizabeth (40 Grove End Road, NW8) - London Bridge Hospital (tooley street, SE1). jgsquash: I don’t know what it would cost you or how hard it would be, but if you can get to a different doc (maybe a specialist) and maybe get an MRI going, that is the only way you are going to know for sure what is going on in there. Your description of weakness and sharp pain when loaded is very similar to how I presented 11 years ago when I did a partial rupture right where my Achilles attaches to my heel bone. It may be nothing but a different phase of healing but I wish I had gone with my gut and gone to a specialist earlier after my full rupture surgery (3 years ago). I just knew there was something wrong but my doc at the time didn’t give me much attention. I waited for 2 years and my new doc (a foot and ankle specialist) knew what was going on right away. He also didn’t try and diagnose me without an MRI either. Good luck! I hope it’s nothing. Keep us posted. I still get pain around the heal area when I walk for a long period (20 minutes or so) of time. Massage seems to sort this out. I am 10 weeks post-op today and find that my foot is still week (although getting better with each day). I have noticed that my walking speed seems to have increase with time. I also notice that after a period of inactivity the tendon does feel tight and requires loosening. I also find that the flexibility in my bad ATR leg seems to be better than my good. I can probably dorsiflex slightly more on my bad leg than my good. I have not done the thomson test since the day of my injury - but I do see movement in my foot when I have my leg on my lap and I massage my calf in a certain region. Once I was in the boot at 2 weeks I did do some dorsiflexion but always carefully and never more than body told me I could do. I can’t believe I have over-stretched this as I have nice tight lump of scar tissue on the repair itself, but maybe I have? That’s interesting, as my surgeon is a knee specialist. I wonder if his experience with knee ligament rehab influenced his approach with ATRs. Your experience with your different surgeries does reinforce my belief that many ATR victims are being unnecessarily tormented with weeks of immobilization. But doctors, like the rest of us, are often creatures of habit, and change comes slowly. I hope that change is coming. This issue of the strength of the tendon versus the strength of the calf was much on my mind early in my rehab. Wouldn’t it be nice if our tendons had little meters that told us how much force they could handle without damage, so we could exercise to near that point but not go past it? Of course, they don’t, so we are left with guessing. The uncertainty is unnerving, because rerupture is a steep price to pay for overestimating. Interesting. I’m at 5 weeks right now, and can push with 60lbs before I feel slight pain in my tendon. I could definitely push harder if I wanted. I guess my calf will keep getting weaker and my tendon will keep getting stronger until my calf is the limiting factor. I’m not supposed to be doing any rehab at all (according to my surgeon). How early did everyone else start calf strengthening? I can only speak for myself, but my answer to your question was different at different times. Up to eight weeks postop, (when I could first hold my weight up on my bad calf), I tended to chicken out before giving my all. My tendon didn’t hurt, I just didn’t feel confident yet going all the way on effort. (As hard as I’ve pushed my rehab, I’m nervous about rerupture, too.) Since then, though, I’ve pushed as hard as I can and as long as I can. Maybe what you are getting at is a fundamental question, is your calf ever strong enough to pull the tendon in half all by itself? I don’t know the answer to that. PeterH, in answer to your question about weakness, my answer would be YES. Yes to both parts. Remember your muscle(s) are weak or unable to do the work being asked of them no matter the effort. There is also pain weakness due to tendon stiffness, soreness, fear of reinjury. Pain helps us guage if we are going to hard or too soon. So my answer would be yes. I can always tell when I’m pushing myself and try to vary my routine of excercise as well to not overwork or underwork any one area. Hope this helps. Just a question for you re-habbing folks. When you say that you are “weak”, what is the limiting factor? Are you pushing as hard as you can with your weak muscle, or is it pain in the tendon which limits your strength? 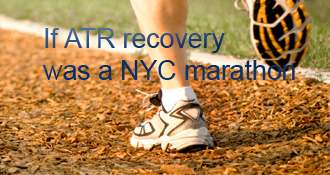 At around 8 weeks, my ATR leg felt weak. When asked by physio to stand on one leg on my bad foot - i could only manage a few seconds at a time. I can now (9 weeks post-op and with practice) manage upto 45 seconds. At 8 weeks post-op I could not do (was not asked to by physio) any heal raises. Now (9 weeks post-op) I can do 2 foot-heal raises (although - I probably favour more weight on my good leg when I do 2-foot heal raises). A tip when doing 2-footed heal (calf) raises is to make sure that your belly-button is central and does not sway towards your good leg-side when doing the raises. I was also told to take approx. 3 seconds on way up and 3 seconds on way down whilst doing the calf raises and to use support if necessary. At the moment, I find it difficult to do 10 x what I describe as good 2-footed heel (calf) raises - but I do find that things get easier with time & practice. At this stage I can not do one-foot heal raise on bad leg - it’s too weak. Gotta go to work, so I’ll be brief. If you’re pushing down with 55 pounds, you’re fine. You don’t have a “lack of strength,” you’ve proven that you have 55 pounds of strength, and you will soon have more. Thanks for the comments Doug. I don’t think I’m “cheating” as you describe, if I lift the heel on the bad leg whilst sitting I can feel it in the calf and heel. So that sounds promising! I have scales at home and have tried the “how much pressure with my bad leg test” at this stage I can manage about 55lbs pushing down with my toes and I’ve noticed this has improved over the last week or so. I’ll try the sitting calf raise with the scales in place and report back. What’s worrying to me following the physio comments is the complete lack of strength in the bad leg and so the questions and doubts start to creep in so it is interesting to hear your comparable experiences. I’m not sure what the NHS physio means exactly by “complete.” If you can push your leg up with your calf while sitting, your tendon must be connecting your calf to your heel bone as it should. That’s exactly where I was at five weeks, nice and flexible but still quite weak. The only bad alternative I can even imagine is if you are “cheating” and actually pulling your leg up with your hip flexor muscles, the muscles you would use to pull your foot right off the ground while sitting. If that is the case, you won’t feel added pressure on the bottom of your foot as the leg goes up. Do you have a bathroom scale? If you still have doubts, you could put that scale under your toes to verify that you are indeed putting some weight onto your toes with your sitting calf raises. I don’t know how reassuring I can be over the internet, but I really think you’re fine, and you just fell outside the “normal experience” of the physios you are seeing. As I said, what you’re describing is exactly how it was for me at five weeks. I’m not finding I have to limit my time/distance walking. By the end of the day my leg is slightly swollen (gravity playing it’s part), and I’d say I’m tired but I’m not finding I *have* to rest it. Don’t get me wrong I’m not walking for miles or standing up endlessly, but I can basically live “normally”. The physio started me off stretching the tendon by keeping the bad leg out behind and ensuring it doesn’t bend and having the good leg out in front and bending this leg to give the “stretch”. To increase the stretch put the bad leg further out behind you. At all times though only use your own muscles to perform the stretch, i.e. no “dynamic” stretching or bouncing, basically keep it gradual and controlled and try and hold the stretch each time. I’m now working towards heal raises, this is my next milestone, i.e. to be able to do one! It remains a long road, but I feel the uphill section is getting behind me. Good to hear things are progressing well with you. I was wondering how far or for how long you can walk in two-shoes unaided without discomfort. I have been in 2-shoes for about a week and can walk for around 5-10 minutes (albeit slowly) before I feel discomfort/tiredness in foot. I have now been to physio 3 times in the last 7 days and have been doing a range of stretching exercises. I can’t do heal raises but the physio has asked me to (pretend) lean forward so that I feel it in the tendon. My flexibility is increasing, but still need a lot of work on strength. I will also start some hydrotherapy sessions shortly. Thanks for posting on my blog. Good to hear you are back exercising and swimming. I’ve been doing lots of good foot cycling on an exercise bike, keeping the busted one elevated and out of the way. It is good to do some exercise and is helping to keep the lbs off! All the best with your recovery, hope you continue to progress well. Hope your recovery is going well. I was wondering if you’re experiencing any pain whilst walking. The reason I ask is that I was NWB for upto 6 weeks post-op. I was subsequently given an AirCast and was allowed to place FWB. I find that my tendon/ankle is fine in the mornings. However, throughout the day it get’s uncomfortable and by nighttime my ankle is quite red and swollen. Elevation and ice sorts this out. I also find that my tendon is stretching when I walk in my cast with one cruch. I was wondering if you experienced similar problems when you first started placing significant weight. I look forward to your response. As in all these things your mileage may vary and what appears to be working for me may not be suited to everyone, so take it easy. Thanks for the link to the video, that was really interesting. Great to hear you are getting the green light to move on to bigger and better things. Great to hear! 4 weeks and out of the boot? I can only hope that my recovery will be as speedy as yours. If there is anything coming out, I guess I would play it safe and stay out of the pool until the skin is completely intact. Can you arrange anything on the inside of the boot to help that last little spot heal? One thing that might help is a “donut” around that spot, something round with a hole in the middle. It would have to be thick enough to keep all pressure off the middle area. It would also have to stay in place, easier said than done. Checking around the foot care area of a drug store might yield something that would be the right shape, size, thickness, firmness, and some adhesive to stick it in place. Doug, on the swimming question, what’s a good rule of thumb on when the suture holes would have healed. My wound looks clean and tidy and has no dressing, steri-strips or anything on it. I have had the tiniest amount of blood discharge from it now that I’ve started PWB and I’m 3 weeks post-op. Newleaf looks to have been given the green light at 7 weeks. I really wouldn’t want to risk infection and was assuming once the initial 2 week cast came off the risk of infection was minimal/lower (but I’m no Doctor!). Rudedog, I’m PWB with two crutches, so this means moving the two crutches and the injured leg together taking most of the weight on your crutches, but enough weight on the injured leg to feel your foot on the floor. I have to say it feels really good and I’m taking it gently but have no pain at all doing this. I’m hoping to gradually increase the amount of weight I put on my leg over the coming weeks but I’ll be listening to my body. Squash’ed is proudly powered by WordPress and WPDesigner..